Last week, the husband and I checked out the bird house display in She's windows. 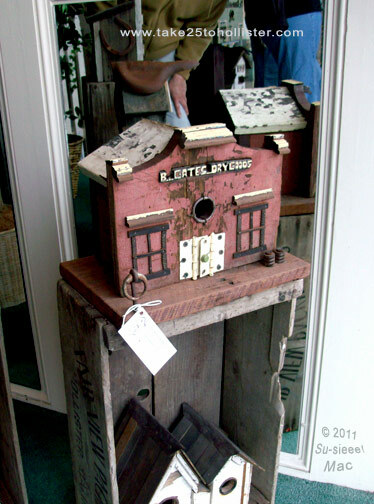 The very cool birdhouses were built by local David Guttirez. Also, cool was the fact that the ladies at the shop let us step into the window so I could take a photo. Or, maybe it's just an image taken by a kooky photographer. It's all how you look at things, no? 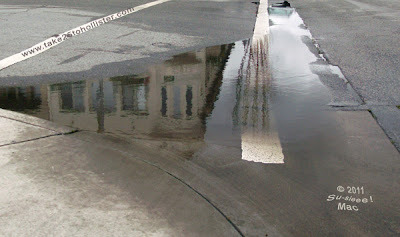 This is the corner of Sixth and San Benito Streets in downtown Hollister. Take 25 is participating in ABC Wednesday, a weekly meme hosted by Mrs. Nesbitt and her friends. Today is the letter K. To check out other K posts, please click here. A side street on the north side of downtown Tres Pinos. 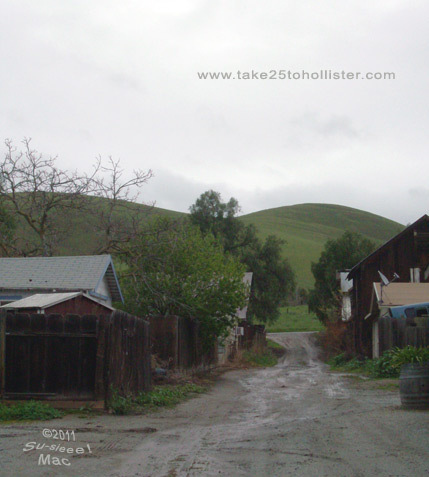 Tres Pinos is the fourth biggest town in San Benito County. The population is 500, more or less. Highway 25 runs right through it. For a small community, it has several eateries. So, it's a great place to stop and grab a bite or wet your whistle when you're touring the back roads of the county. 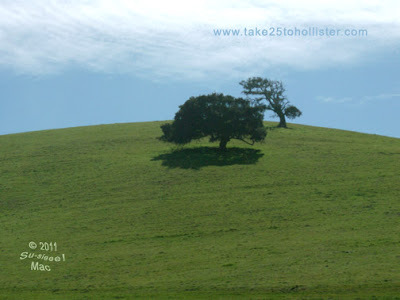 Where to Walk in Hollister? 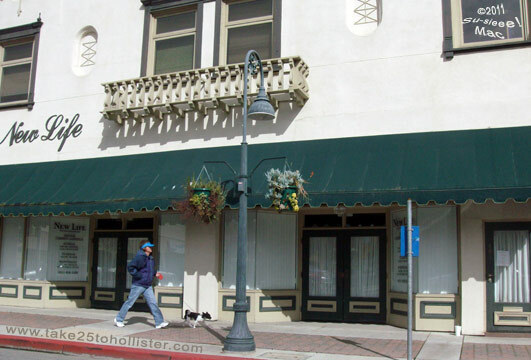 Downtown Hollister is a nice place for walking, alone or with a friend or two. The YMCA hosts walks on Friday mornings. For more about the walks, click over to this page at the Hollister Downtown Association. You can also download a brochure of suggested short walks, such as the 1.3 mile Historic District Walk, which you can do on your own. at the San Juan Bautista Mission Plaza in September 2010. El Teatro Campesiño, in San Juan Bautista, will be holding auditions in April for its summer production of Popol Vuh: A Cosmic Pageant. 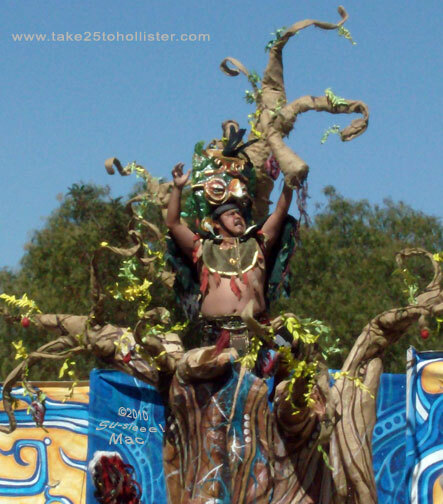 The epic play is based on the creation story of the Maya. For more information about the auditions, click over to this page at the theater group's Web site. 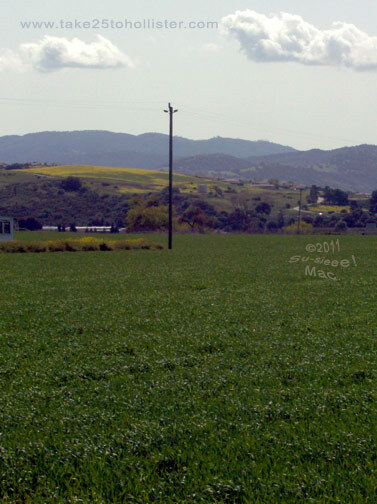 Looking south at the Gavilan Mountains from . . . you'll never guess. Buena Vista Road. Who ever named that road definitely got it right! "What do you want to eat?" 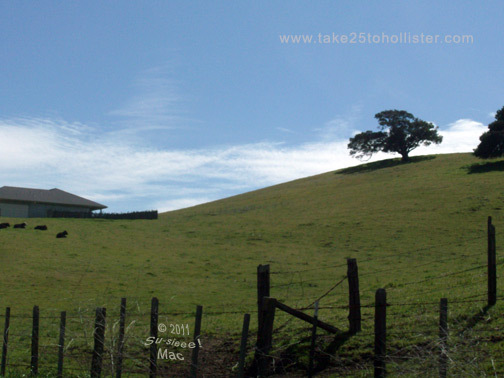 I asked the husband, the other day, as we drove back into Hollister. "Something tasty," said the husband. After some consideration, we decided to check out Dreamy Buffet on McCray Street, next to the movie theaters. The husband was wary, even though I said the restaurant was under new ownership. Neither of us were impressed with the food or the service of the former owners. Hello, hello. Things have definitely changed with the new owners. The restaurant is inviting and relaxing. The all-you-can-eat buffet of Chinese and Japanese food was yummy. And, the staff was friendly. I'm ready to go back and check out the things I didn't try. 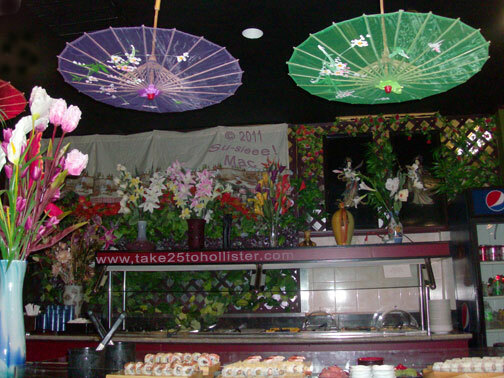 Or, maybe just enjoy more of the sushi, the spicy fried chicken, and the Chinese dishes with the veggies. Yummmm. This photo was taken at last year's concert. On Monday, March 28, the Pacific Brass Band will hold a benefit concert for the Mr. Ostenson's Save the Music Drive at Marguerite Maze Middle School on Meridian Street. (Memorial Drive is the cross street.) The performance will start at 7 p.m. 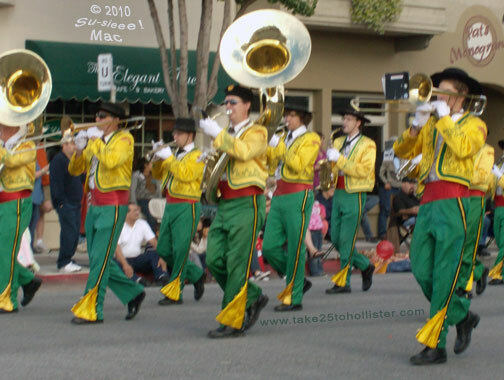 According to its Web site, the Pacific Brass Band is one of a very few British brass bands that exist on the Pacific Coast, not including the Salvation Army bands. The band is composed of musicians from Santa Cruz, Monterey, San Benito, and Santa Clara counties. For more information about the band and the spring concerts, click over to its Web site. The Mr. Ostenson's Save the Music Drive is sponsored by the Rancho-Maze Middle School Band Boosters and the San Benito High School Band Boosters. Its goal is to raise $156,000 to fund the elementary school music program in the Hollister School District for two years. In December 2010, the The Hollister School District board voted to eliminate the elementary school music program after this school year because of lack of funds. For more information about the fundraising drive, click over to its Web site. This week's letter is J. The other day I took a jaunt down Riverside Road in search of the Japanese Temple Garden. Could not find it. 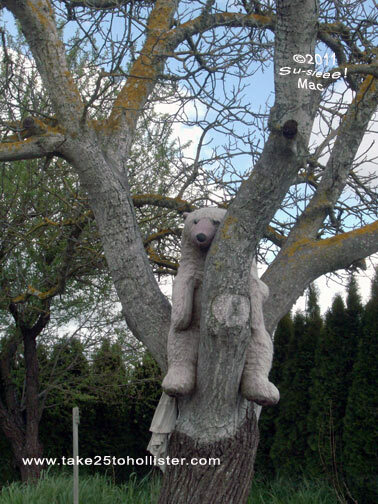 I spied a truly jolly guy jauntily perched in a tree. Of course, I had to backtrack so you all can see the bjorn, too. 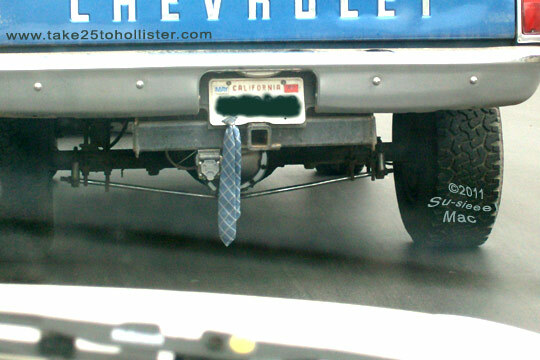 Long ago, cowboys would tie their horses to hitching posts before going into the saloon to get wasted. Just saying. 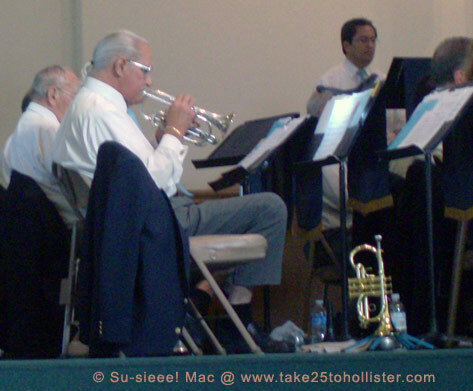 This Wednesday, March 23, the Watsonville Community Band will be presenting its annual Spring Concert in Hollister. It will take place at the Veterans Memorial Building on San Benito and 7th Streets at 7:30 p.m. Admission is free. Donations will be asked at the door to support the Mr. Ostenson's Save the Music Drive, which is seeking to raise $156,000 to fund the Hollister School District elementary school music program. For more info about the fundraising drive, please click here. 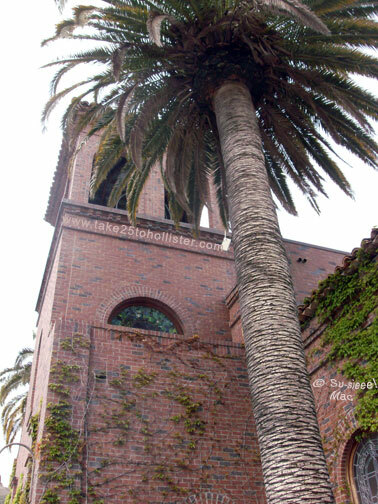 The Watsonville Community Band is composed of musicians from Santa Cruz, Monterey, San Benito, and Santa Clara counties, The Hollister concert is the third of the four concerts in its 63rd Spring Concert Series. For more information about the band and the spring concerts, click over to its Web site. I saw these dancing trees while the husband and I were heading south (or was it east?) on Union Road. Of course, I wasn't driving. That's right. 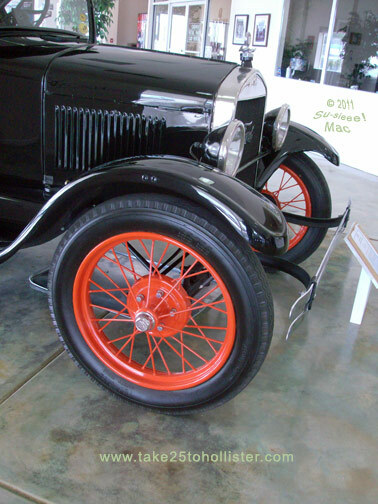 It's a 1926 Ford Model T Roadster Pickup. It was on display at Tiffany Motor Company a week or so ago. According to the sign, it was assembled on October 1, 1926 in San San Francisco. The original price was $381. Ahoooga. Beauty is everywhere. Recognize the road-most-often-taken that this large puddle is beside? Click on the photo for the full size. The other day I woke up thinking that I gotta take photos of the fields at the end of Hillcrest Road. Before they are no more. One thousand plus homes will be going in and beyond what you see in the photo. Santana Ranch. The development was approved last November. Anyone know when the building will commence? I will miss the open space. Take 25 is participating in ABC Wednesday, a weekly meme hosted by Mrs. Nesbitt and her friends. Today is the letter I. To check out other I posts, please click here. Yes! Another shop will be opening in downtown Hollister soon. 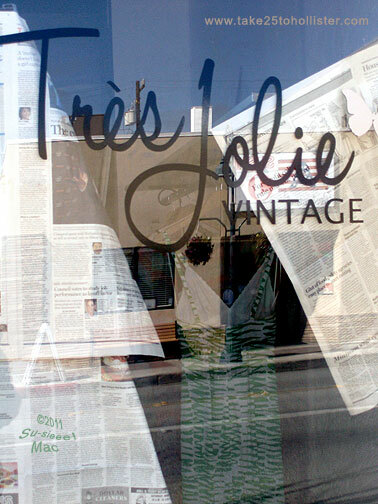 Birdies say that Trés Jolie Vintage, a boutique, will be opening on April 1. Check out the shop's Facebook page for the latest news. The store is located at 748 San Benito Street, a door or two down from the new butcher and market. Do you know the Savvy Seconds Boutique in Morgan Hill? Trés Jolie Vintage is its sister store. Whoo-hoo! Bump, bump, bump! I just like the look and sound of that word. Bump. 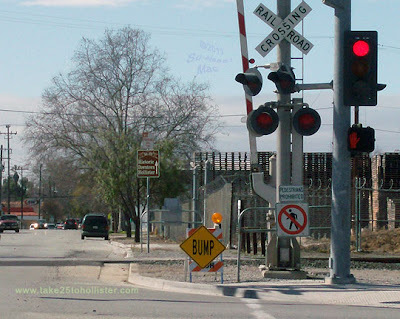 By the way, how do you get to the other side of the tracks, if you're walking? The sign says you can't walk in that patch there. So, for that matter, why put up a crosswalk then. Just wondering. Glorious green. Looking south from Southside Road, near Ladd School. That's right. 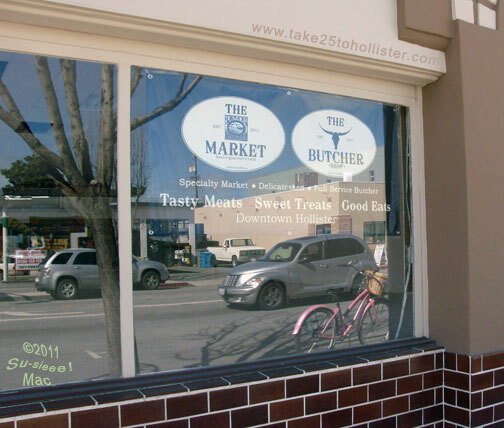 A butcher shop and a specialty market will be opening in the store front formerly known as Brothers Market, and before that, the Public Drive-In Market, at the corner of South and San Benito Streets. Yum! Anyone know when the grand opening will be? Did you know you can use a credit card to pay for leaving your garbage at the dump? Ours cost $10 the last time we were there. They took a ten-dollar bill. No checks though. 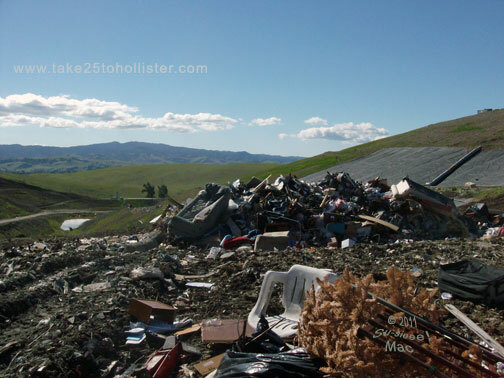 For more info about the local dump, excuse me, landfill, click here. This was taken a year ago on a foggy day at the Pietra Santa Winery on Cienega Road. The building as you can see is gorgeous. So is the setting, as many of you know. 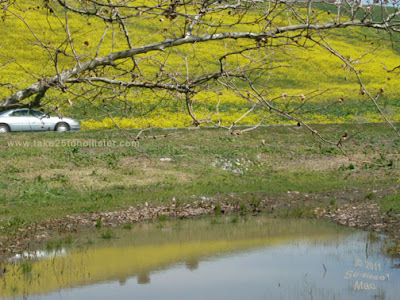 Never taken a drive out to the winery and beyond on Cienega Road? What are you waiting for! I admit it. I am biased. 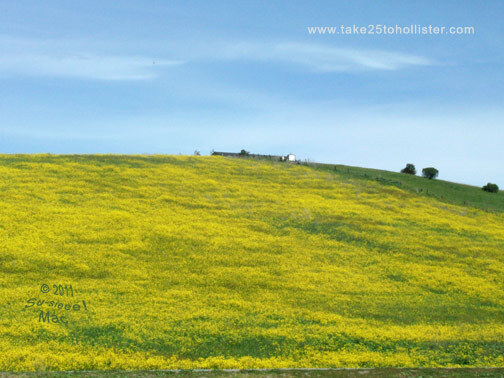 The hills (and mountains) of Hollister are simply beautiful, green or golden. This hillside flanks the western side of Union Road, just several miles from downtown. 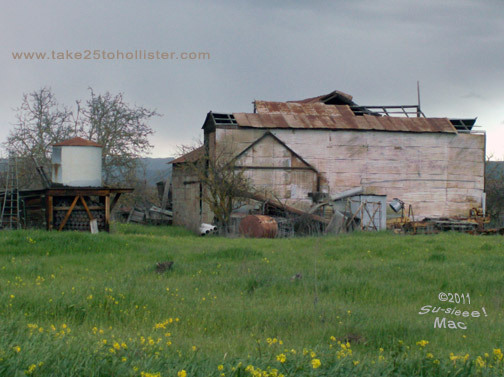 Nothing like the true Hollister, California, eh? Take 25 is participating in ABC Wednesday, a weekly meme hosted by Mrs. Nesbitt and her friends. Today is the letter H. To check out other H posts, please click here. 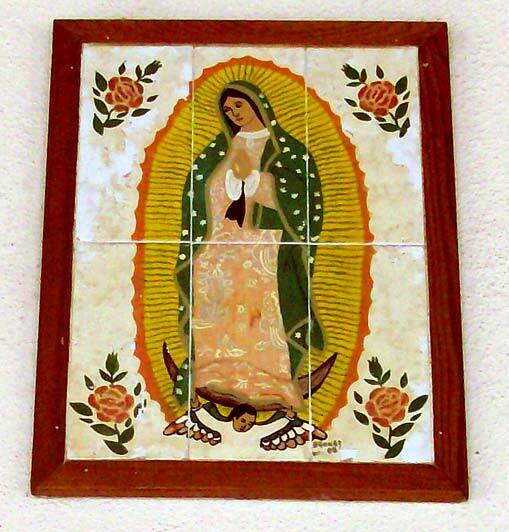 This is a close up of one of the beautiful pieces of tile art hanging on one of the buildings at the St. Francis Retreat Center above San Juan Bautista. Recognize any names? 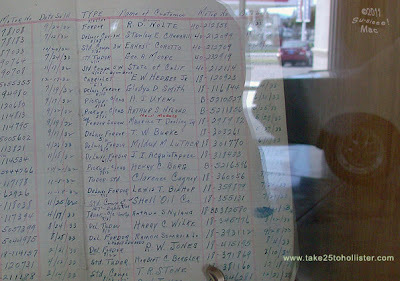 The book shows who bought what during the 1930s from Tiffany Motor Company, which is the oldest Ford dealer in California. This year the local business will be celebrating its 101st anniversary. 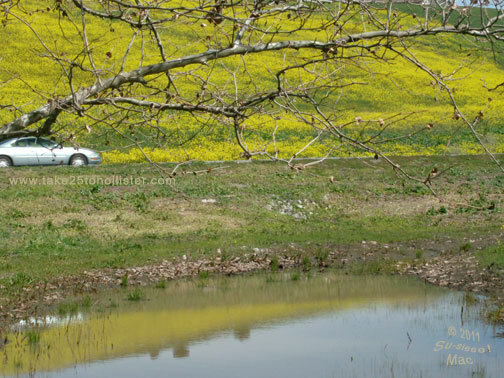 Yellow mustard in bloom all up and down this hillside on Union Road, near the intersection at Highway 156. The clouds were glorious this past week in Hollister, particularly on Thursday. 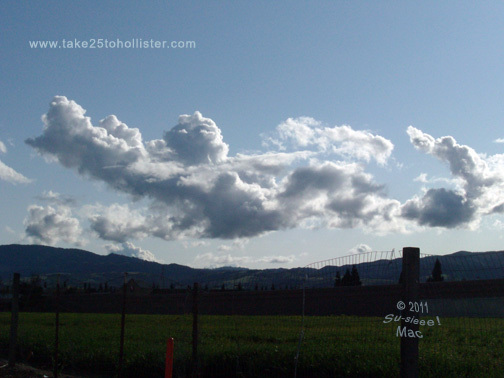 Doesn't this cloud look like a guy happily floating on his back? 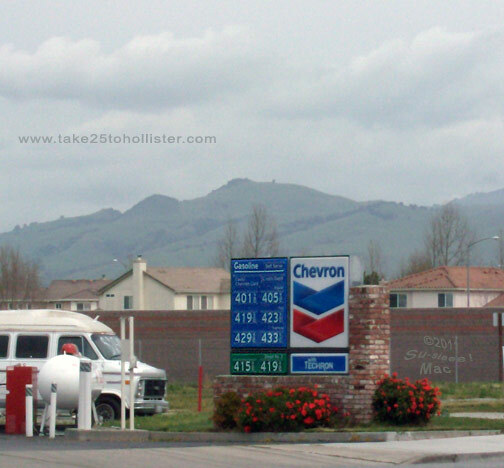 Last week, I posted a glance of Fremont's Peak from Hollister. 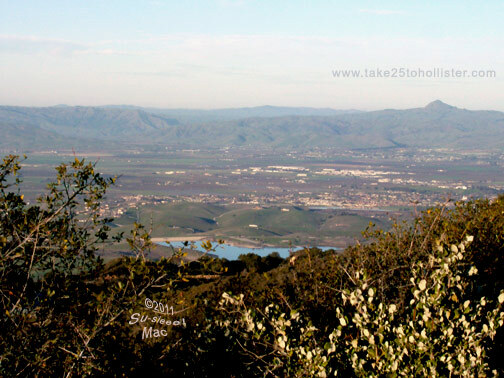 Today, you can see how part of Hollister looks from Fremont's Peak. What do you think that body of water is in the foreground? Got small kids? Need them to work out their ya-ya's after being cooped indoors. 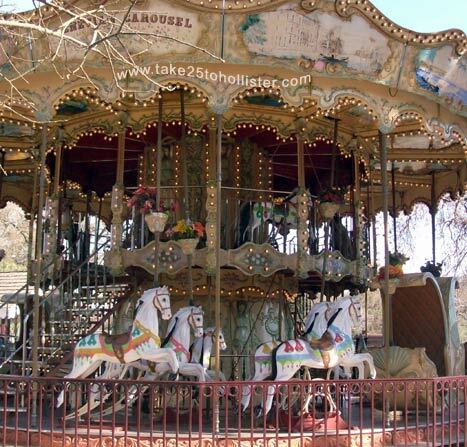 How about a treat on the carousel at Casa de Fruta? It's not what you think. 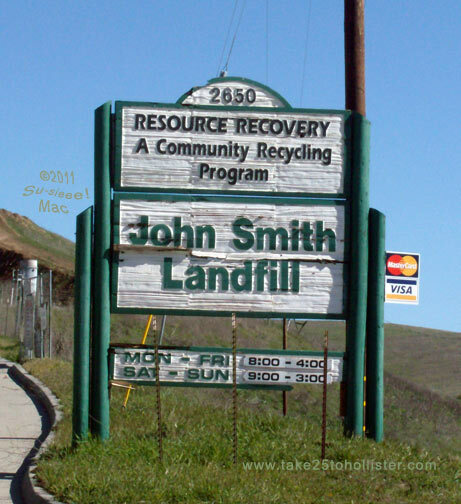 This is at the top of the John Smith Road Landfill, the local dump for San Benito County. It is possible that one of these days, way, way, waaaaaaay in the future, the landfill may be a solid mountain peak like that in the distance. Think about it. 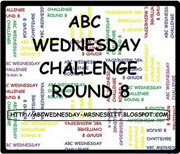 Take 25 is participating in ABC Wednesday, a weekly meme hosted by Mrs. Nesbitt and her friends. Today is the letter G. To check out other G posts, please click here. 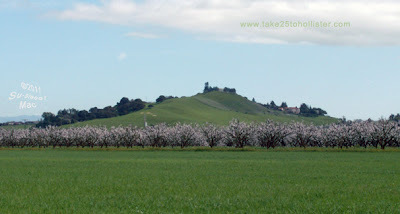 This is what remains of the last apricot orchard on Hillcrest Road. The owners have slowly been pulling out the trees over the last few years. I understand that eventually this land will be paved with homes and apartments.